Colin Dale wears sky blue high top Converse “Chuck Taylor” All Stars in the film. Tim and Nick Diamond working on a case. 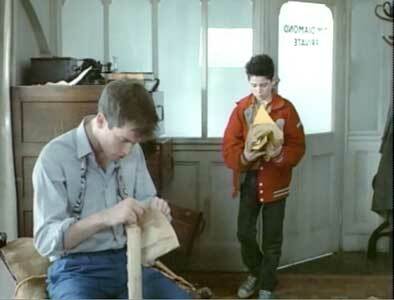 Nick (Colin Dale) is a thirteen-year-old kid living in the Camden Town area of London. He lives with his older brother Herbert Simple (Dursley McLinden), who insists on being called Tim Diamond, in their small detective office flat above a subway station. Their parents had immigrated to Australia, so Tim is the only family Nick has left. Tim is somewhat incompetent as a detective, and as the film starts, they are broke, their credit overdrawn at the local grocery shop run by Mr. Patel (Saaed Jaffrey), and desperate for even a can of beans to eat. Nick, who also narrates the film, is the one with the brains and detective ability in the family as things turn out. It is two weeks before Christmas in December when suddenly things take a turn for the better. A midget sized man named Johnny Naples (Rene Ruiz) comes into the office and pays Tim 100 pounds to watch a small package for him for several days. Now they can pay off Mr. Patel, go out to dinner, and even see a movie. It is an old Philip Marleau flick, Murder, My Sweet. Film noir is part of the set up for the story line of Diamond’s Edge, which pay homage to this film genre in its plot devices and characters. Tim doesn’t get most of the plot points, which Nick has to explain to him on the way home. Nick discovers a clue in their ransacked office. When they arrive back at their flat, they discover that it has been broken into, and completely ransacked. But luckily Nick was smart enough to take the package with him. They receive a telephone call from the Fat Man (Michel Robbins), a local mobster who demands that they give him the package within two days. Now Nick insists on opening the package, which turns out to be a box of Maltesers candy. But there is nothing inside the box except candy. However, Nick realizes the envelope containing the box of candy provides a clue to where the dwarf-sized man who left the package with them might live. When they do track him down, he is dead in his hotel room. The police arrive and arrest Tim and Nick, when they find Tim examining the murder weapon. At the station they run into Chief Inspector Snape (Bill Paterson) and his sidekick Boyle, who wants to rough up Tim and Nick. Tim was a former police constable, fired for incompetence. Nick again saves the day by persuading Snapes to tell them everything he knows in exchange for what they know. A hidden fortune in diamonds is at stake here and we are introduced to the various characters after the fortune. Tim and Nick languish in police custody. Tim and Nick are released by the police and follow another clue Nick found in Johnny Naple’s hotel room, a matchbook from the Casablanca Club. Nick goes into the club, disguised as Johnny Naples and meets up with singer Lauren Bacardi (Susannah York). When the brother explain to her that Johnny Naples was now dead, she tells him of their long affair and plans together. Nick asks about the Maltesers, and Lauren tells him that Johnny was never without a box of them and that there was something significant about them. Shortly Lauren is kidnapped by two German thugs Gott and Himmell (get the joke) and held captive in a penthouse. Later Tim is arrested again when the Fat Man’s chauffeur is found dead in his office. Now Nick is on his own. 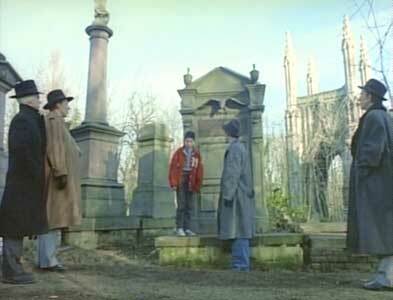 After meeting with the professor (Michael Medwin), Nick goes off to investigate. But he is kidnapped by Gott and Himmell (Peter Eyre and Nickolas Grace) and brought to their penthouse for questioning. The balance of the film is how Nick escapes (with Lauren) and solves the mystery while dealing with all of the others after the treasure. Gott and Himmell kidnap Nick and take him to their penthouse. Diamond’s Edge is a gem of a mystery. Although designed for kids, it actually it has more appeal to adults who know the history of cinema, with its built in tributes to the film noir genre, adult-like puns in the characters’ names, and old fashioned story line, like you would see in a typical film of that genre. The film was BBC produced in London, and the cinemaphotography gives you a tour of typical film noir locales, nightclubs, seedy flats, train stations, and beautiful mansions. Even the name of the candy reminds you of The Maltese Falcon. It’s too bad the DVD hasn’t gotten much publicity. The couple other reviews of Diamond’s Edge don’t even get the characters and story correct. Colin Dale delivers a fine performance as the streetwise, cheeky kid who has the ability to figure things out, bluff adults, and solve the mystery, all told from his point of view. A bevy of British character actors were brought in to play the police and villains. Susannah York is charming in her role as the nightclub singer Lauren Bacardi. From one of the covers to the DVD, it seems like part of the plan was to promote Dursley McLinden, who plays Nick’s older brother, Tim. But his performance is way overshadowed by that of Colin Dale. As a “family” mystery, the film is a little dark and violent for most younger kids. As a regular mystery it is a very enjoyable eighty minutes. Nick explaining the mystery at the cemetery. The Fat Man’s henchmen have grabbed Nick. 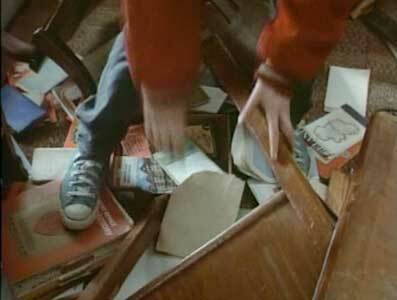 Colin Dale in his role as young detective Nick Diamond wears sky blue high top chucks throughout the film. The cinemaphotography is somewhat chucks-friendly with a lot of ceiling down shots and full body shots as Nick and Tim investigate around the streets of London. There are a few good close-ups, when Nick is in custody with Tim, grabbed by Gott and Himmell, and walking through a cemetery. Nick walks through the cemetery toward his meeting with the Fat Man. Diamond’s Edge. (1988) Colin Dale, Dorsley McClinden, Susannah York, Peter Eyre, Bill Paterson. Directed by Stephen Bayly. Categories: Action/Adventure, Family, Drama.